These have been a couple of crazy weeks in Wendolonia-land. We moved last weekend and total and complete chaos has ruled my life for most of the last two weeks. Normally, I feel like I have my act together — at least as far as the day to day routines of our household go — but as you can imagine, when you’re moving all hell breaks loose! I have managed to pack the kids some lunches but I’ve been spotty about it. 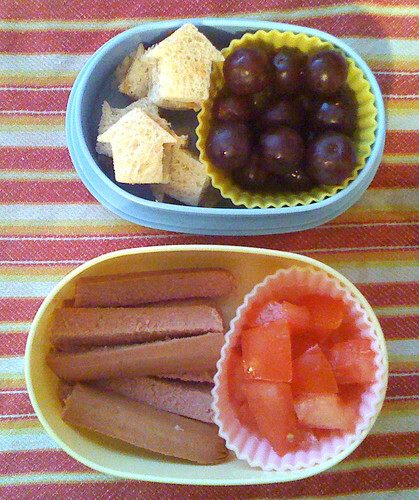 There have been lots of school lunches for the six-year-old. Honestly, I think I’ve done a better job packing lunches than should be expected — especially since 2/3 of my kitchen is still in boxes! Last Monday my 1st grader’s lunch was decent, if a bit skimpy. He had garlic toast stars, a few skewers of grilled chicken, snap peas and blueberries. 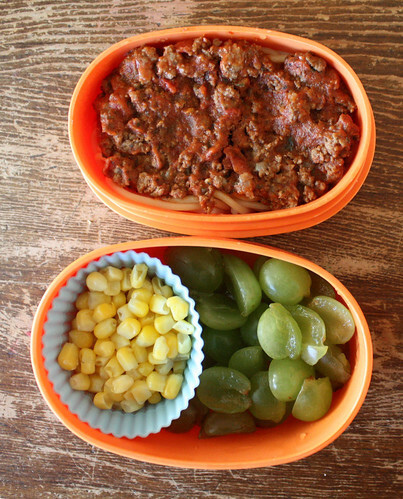 On Tuesday, Augie’s lunch was leftover meat spaghetti, corn and green grapes. 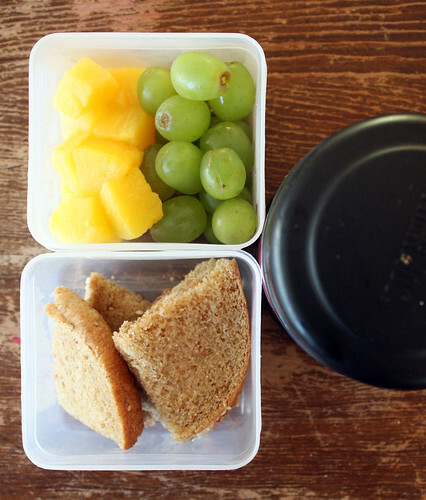 Wyatt also had leftover spaghetti (in the thermos) along with canned pineapple, grapes and garlic bread that I made from a whole wheat hamburger bun and then chopped up into wedges. 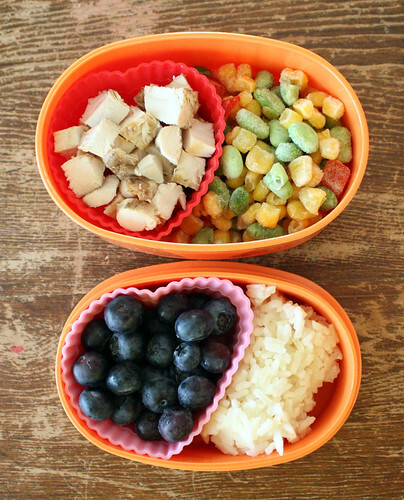 My two-year-old’s lunch on Wednesday was chopped grilled chicken, soycatash (his daycare provider heats food for him so I can put it in frozen), rice and blueberries. This was the day Wyatt started eating school lunch every day. Then we moved on Sunday. 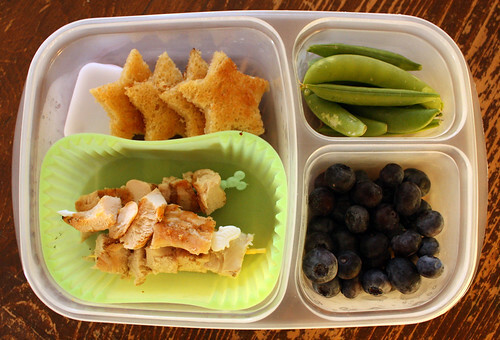 I have to pack a lunch for Augie on his daycare days no matter what so despite being totally unprepared for making a bento, I managed to pull this one out of my…er…the air. It was no easy feat, I can assure you. This lunch had teeny tiny peanut butter sandwiches cut into the shape of a house because we had just moved into a new house. I know it was over the top, but our knives are still packed in a box and the cookie cutter was actually unpacked, so I went to the crazy-bento-lady place. It also had grapes, chopped tomatoes, and a turkey hot dog that I cut up with a plastic knife. This lunch is also noteworthy because this is probably the worst lunch photo I’ve ever posted publicly. I took it with my phone in a dark kitchen on a rainy day on a dish towel that was only semi-clean. Appetizing. By Wednesday, I’d managed to dig my camera out of a box and I’d made a quick run to the grocery store for a few provisions, so I was up for packing a lunch for Wyatt again. 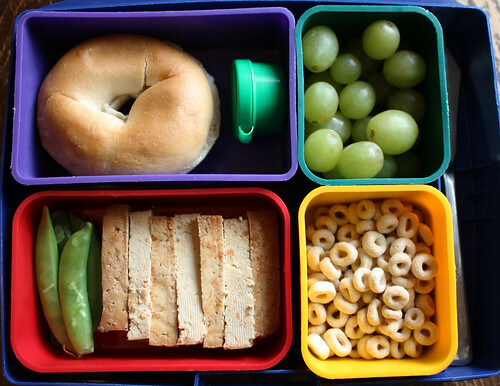 He had a mini bagel with a small pot of strawberry cream cheese, grapes, Cheerios, baked tofu and a few snap peas. 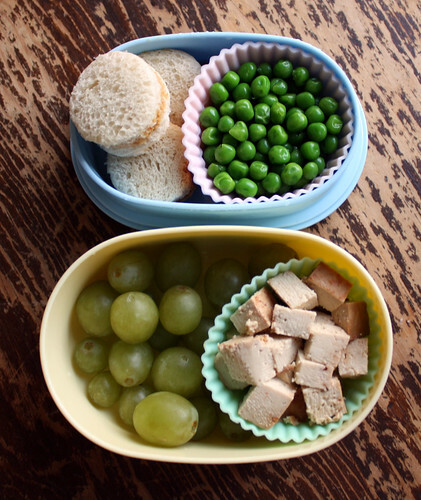 Augie’s lunch had more tiny little peanut butter sandwiches, peas, chopped baked tofu and grapes. Wyatt’s lunch on Thursday got the new house treatment too. 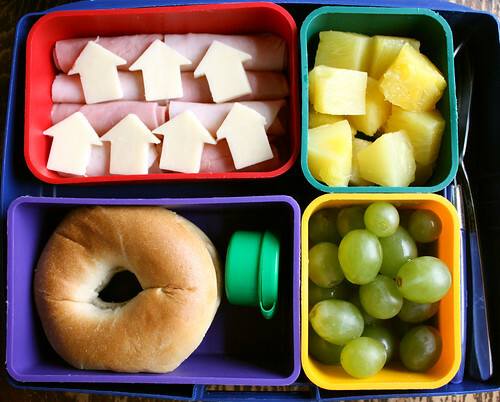 I packed deli turkey slices (rolled up), monterey jack cheese houses, canned pineapple, grapes and another bagel with strawberry cream cheese. I just finished cleaning the old house and clearing the last of our junk out late last night. I was totally zonked this morning so I told Wyatt to buy lunch again today. Now it’s time to concentrate on getting our new house unpacked and set up! Previous post: Goodbye, Foxy Fox!